This course is designed for practitioners in the construction industry interested in the basic principles of construction law. It will review general rights and obligations of contractors and employers, as well as time, payment, SOP and dispute related issues in construction contracts. It is principally designed for non-lawyers in the construction industry but lawyers seeking an introduction to this area may also be interested. It will be taught in 4 evening classes. A Certificate of Attendance from the SCL (Singapore) will be issued to all attendees who fully attend and successfully complete the Course. Thursday, 4 October (6:45pm – 9:30pm) Module 1 – Introduction to Construction Contracts, including concepts of completion, DLP, EOT, etc. Tuesday, 9 October (6:45pm – 9:30pm) Module 2 – Subcontracting & Payment Principles, including the Role of the Certifier, Valuations etc. Thursday, 11 October (6:45pm – 9:30pm) Module 3 – Default and Dispute Resolution, including claims procedure, common heads of claim, etc. *There will be a 30min dinner break for each session. Registrations will start from 6.30pm. Course starts at 6.45pm sharp. Mohan Pillay conceived & developed this 4 evening program in 2010, when it was first launched. He is the Managing Partner of the Singapore law firm MPillay and Joint Head of Office of the Singapore Joint Law Venture of Pinsent Masons MPillay LLP. He is a Singapore and UK qualified dispute resolution lawyer with 30 years’ experience in advisory, commercial litigation and regional arbitration work, particularly in construction and engineering projects. Mohan is a Chartered Arbitrator and presently the Hon Treasurer of the Singapore Institute of Arbitrators (SIArb). His past appointments include President of SIArb, Co-Chair of the Dispute Resolution & Arbitration Committee, Inter-Pacific Bar Association (IPBA), Chair of SCL (Singapore) and the International Construction Projects Committee, IPBA, as well as teaching appointments as Adj. Assoc. Professor, Faculty of Law, National University of Singapore (2003 - 2011) and Visiting Professor, Centre of Construction Law & Dispute Resolution, King’s College London (2005 – 2011). He is one of the General Editors of Singapore Construction Adjudication Review and the Singapore Journal of Construction Law, and co-author (with Toh Chen Han) of “The SICC Handbook – A Guide to the Rules and Procedures of the Singapore International Commercial Court” (Sweet & Maxwell, 2016). He is also one of the chapter authors for the Singapore Academy of Law Annual Review of Singapore Cases' chapter on building and construction law. Chen Han's area of practice is Dispute Resolution. He focuses in particular on construction, engineering and commercial disputes, and related advisory work. The cases on which Chen Han has acted involve a range of matters including tracing and restitution of monies, conspiracy, expressway design and construction, power plant design, construction and operation, cargo-facility construction, water works, mixed research and commercial developments, and hotel management disputes. He is described by Legal 500 as a name to note for construction and dispute resolution, and a go-to individual for complex delay claims, who is unafraid to dive into details. He has written for various publications including the International Construction Law Review. He co-authored the SICC Handbook – A Guide to the Rules and Procedures of the Singapore International Commercial Court (Sweet & Maxwell, 2016) and the chapter on Enforcement of Foreign Judgments and Foreign Arbitral Awards in the Law and Practice of Commercial Litigation in Singapore (Sweet & Maxwell, 2015). He is also a Contributing Editor for the Singapore Journal of Construction Law and a Fellow of the Singapore Institute of Arbitrators. Yeo Boon Tat is a Partner at Pinsent Masons MPillay LLP. His practice focuses on commercial litigation and regional arbitration work, with an emphasis on construction and engineering. He is an experienced and well-regarded counsel who has represented clients at all levels of the Singapore courts, in arbitrations, and in adjudications. . Boon Tat has advised and represented clients on disputes relating to power and petrochemical plants, water treatment facilities, and infrastructure projects in Singapore, China and Vietnam. He has also represented clients on a variety of commercial disputes such as joint venture, technology and employment disputes. In addition, he also advises on non-contentious matters relating to building and construction projects. Boon Tat graduated from the National University of Singapore in 2003, and was called to the Singapore Bar in 2004. Please register for this event using the online form below or download the REGISTRATION FORM HERE. 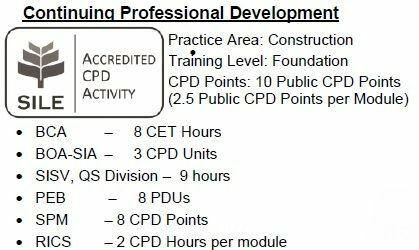 SCL (Singapore) is accredited by the SILE for its Continuing Professional Development Scheme for CPD Year 2018. For more information, including details of the Attendance Policy, please visit: www.silecpdcentre.org.sg.